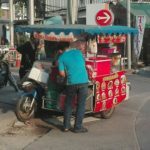 The decline of Pattaya’s street vendors isn’t unique. In fact over the past 12 months, the Administration in Bangkok has evicted nearly 20,000 street vendors from over 30 public places. This is all part of a campaign to tidy up the streets and pavements a direct result of unfolding social, economic and environment issues. Cleaning up Pattaya the city seems to be suddenly on the agenda and a hot topic just now with recent actions surrounding Baht buses this clearing of the streets is done to help Pattaya’s choked traffic by removing illegal non tax paying vendors from the streets. The issue of illegal street food vendors has long been on the political agenda with politicians long claiming a will to clean up the streets. Until martial law no politicians had made good on their pre-election promises. Now the army have substantial policing power which slowly are beginning to be enforced. Having lesser food retailers not only means reduced choices for the working class, who eat out more often than they cook at home, but it also means that less common dishes will simply fade away as the food stalls pack up for good under instruction from enforced evictions. But, maybe the biggest loss to Pattaya if this continues is its uniqueness of coming together of different cultures and classes of people. The street stall eatery is one of the very few places where business people can mix with the people who have a lesser standing in the employment world and social structure of Thailand. Everyone sits on the same bright plastic stools, everyone enjoy the same noodle soup with well used kitchen utensils. However, if the food court meals become the cheapest food available at around a 100 baht then the already large divide that exist between the white and blue collar workers becomes even greater. Street food is quite simply Thailand’s treasure it cannot be lost along with the diverse group of street chefs who make the often delicious cheap food. Perhaps the route to take is as they have done in Singapore and implement Urban Design & Development that has space within it to accommodate these street stalls, sustainable well thought out city planning may well be the answer and savior to the declining number of street vendors in Pattaya.